Lock in a great price for Holiday Inn Madrid - Pirámides – rated 8.2 by recent guests! Good location, next to the Metro. Makes it convenient for you to explore the city. 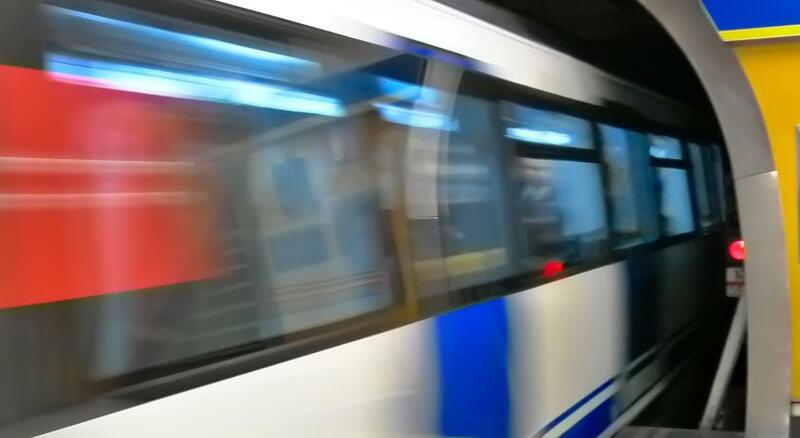 Very close to both the suburban railway and the metro. The breakfast was a beautiful spread! Liked how comfy the bed was. Secure building with having to ring the doorbell for the front door at night. Right next to an "Irish pub" with an awesome waitress! Metro stop really close by. (Don't confuse it with the train stop right in front!) Front desk/housekeeping/food service was very nice and on top of things. Nice area with a large park and bridge over a small river. Many places to eat and drink. There are a few stores in close by if you need to buy snacks and bottled water. The staff was very helpful in providing us places to visit around Madrid. Good location closed to public transport and city center. It was very clean and organized. The staff were very helpful and the food was pretty good. The room was very comfortable, clean and a good size. The staff were very friendly and knowledgeable. Close to the metro, good size bathroom and room. Beds nice and comfy. I was blown away by the service I received from the reception staff and the correspondence before my trip. I had to make a couple of alterations to the room and My expectations were exceeded. The cleanliness of the room was great. Very, very comfortable. And absolutely fantastic value for money. If I ever visit Madrid again I would stay here. 100% reccommend. Thank you for a great stay! Holiday Inn Madrid - Pirámides This rating is a reflection of how the property compares to the industry standard when it comes to price, facilities and services available. It's based on a self-evaluation by the property. Use this rating to help choose your stay! The modern Holiday Inn Madrid - Pirámides combines comfortable rooms and suites with great public transportation. 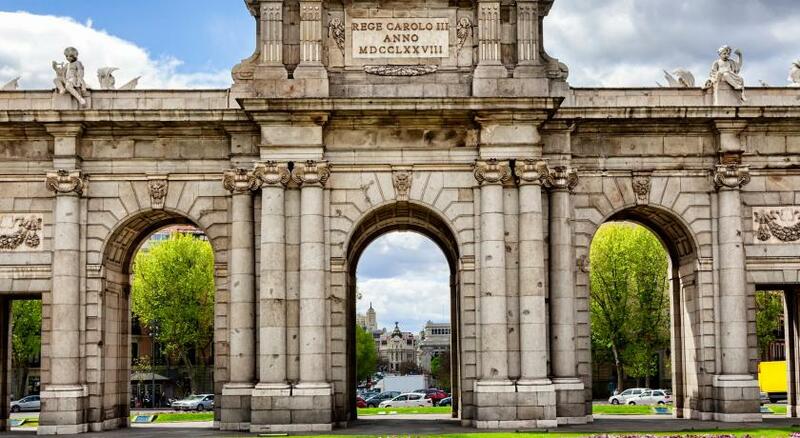 Piramides Train and Metro Station are across from the hotel, and you are walking distance from Madrid’s main sights, including the Royal Palace. All of the rooms in the Pirámides have digital safes and marble bathrooms. They also have satellite TV. Wi-Fi is available upon request, for an additional fee. The hotel also offers rooms without carpet for people with allergies. The hotel’s restaurant, Acuarela, offers a variety of Mediterranean and international cuisine. It is open for breakfast, lunch and dinner. The hotel also has a cafe open until late. Toledo Street, the Rastro market, Plaza Mayor and the 'Art Triangle' are walking distance from the hotel. There is also very good access to the M30 and M40 highways. Arganzuela is a great choice for travelers interested in parks, museums and monuments. 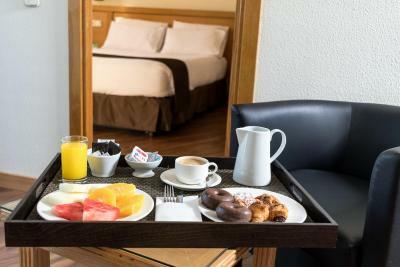 When would you like to stay at Holiday Inn Madrid - Pirámides? Spacious air-conditioned room with flat-screen satellite TV. There is a safe, work desk and minibar, as well as a teakettle and coffee maker. The private bathroom comes with a hairdryer and toiletries. Private parking is available on site (reservation is not needed) and costs EUR 20.90 per day. This spacious air-conditioned room has a separate lounge area with a sofa bed and flat-screen satellite TV. There is a safe, work desk and minibar, as well as free bottled water, a teakettle and coffee maker. The private bathroom comes with a hairdryer, bathrobes, slippers and toiletries. This air-conditioned room has an extra-long bed, a safe and a flat-screen TV. It has a minibar and a teakettle. Free toiletries and hairdryer are available. This air-conditioned room features an extra-long bed, a safe and a flat-screen TV. It includes a mini-bar and a kettle. Free toiletries and hairdryer are provided. Hotel surroundings – This neighborhood is a great choice for travelers interested in parks, museums and monuments – Check location Great location - show map Guests loved walking around the neighborhood! House Rules Holiday Inn Madrid - Pirámides takes special requests – add in the next step! Holiday Inn Madrid - Pirámides accepts these cards and reserves the right to temporarily hold an amount prior to arrival. We could hear noise from the room next door. The area is pretty quiet and we had no road noise. I don’t have one single complaint. It was all perfect. Shower is not good which water is quite weak. I can even hear someone at my next door was snoring at night. The decorations are too old. Staying inside are stuffy. The room was extremely warm and the temperature regulator wasn't working. The location was great (next to a train station), the stuff was very helpful and the room was big and comfortable. There were 2 single beds pushed together, I thought when I booked a double room we would get a double bed. AIR CONDITIONIONG NOT WORKING PROPERLY. TOO HOT NO POSSIBILITY TO REGULATE. NOISY FROM OTHER BEDROOMS.